What do you get when you mix Twin Peaks with Archie Comics? You get Riverdale. A dark and picturesque mystery that pulls you in with dreams of white picket fences and hidden secrets. It may sound strange at first, but it works. Riverdale Season 1 Episode 1 introduced us to the small town of Riverdale, and the familiar faces/places we grew up reading in the Archie Comics. But it's nothing like the comics. This is Archie with an edge. The introduction to the mystery pulled me in from the start. The sound and editing teams did a great job with creating the perfect creepy feeling. Everything from the slow car ride (that car was so Archie Comics!) to the music selection in the flashback – it's perfect. I especially loved the opening song. It's dreamy and gives the feeling like something is off. Does anyone know the name? Our story is about a town; a small town and the people who live in the town. From a distance, it presents itself like so many other small towns all over the world...safe, decent, innocent. Get closer though and you start seeing the shadows underneath. The name of our town is "Riverdale". Permalink: Our story is about a town; a small town and the people who live in the town. For the most part, all of the characters fit their comic book counterparts. 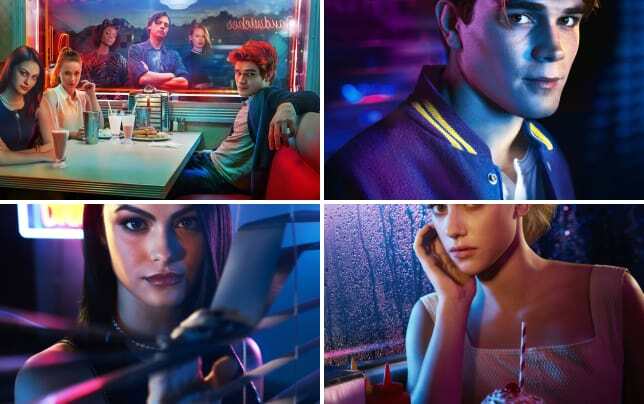 Betty is the sweet girl-next-door, Archie is the all-American boy, and Veronica is the rich girl with style. But there's more depth to them. I like Archie's passion for music. He seems determined to make a career out of it. However, the resistance he gets from his father and Josie seem unreasonable. Sure, his dad not wanting him to pursue music makes sense, since it's hard to succeed in, but him forcing a construction career is not. Josie, on the other hand, came off mean to someone starting out. Many artists perform songs created by other songwriters and while her basis is justified, I hope we see a new side of her. Veronica is a pleasant change. She's more caring, witty and has the urge to change her "rich girl" trope. I think what throws me off about her though is her knowledge of film references. What 15 year old references Truman Capote and Blue Jasmine?! Veronica: I'm filled with dread. Veronica: Are you familiar with the works of Truman Capote? I'm "Breakfast at Tiffany's" but this place is strictly "In Cold Blood." Permalink: I'm filled with dread. I thought she changed, that is until she kissed her new friend's crush! Veronica started so strong and was proving to be a good future BFF. It would be a shame if this throws a wrench in the friendship. I was always Team Betty in the "Betty vs. Veronica" debate. But I hope this love triangle doesn't start; their friendship is more important. Are you Team Betty or Team Veronica? Also, how evil is her father?! 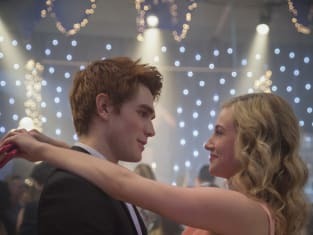 She teases his reputation and the reason why she came back to Riverdale, but doesn't say much else. He sounds like a future villain. Did anyone else's heart break for Betty? Mine was in pieces. She got the raw end of the deal this episode. Her longtime crush isn't interested in her, her mother is overbearing, and her new friend betrays her – this would bring anyone to tears. It's a shame because she was so confident before it all went wrong. Speaking of Betty's mother, what is going on with Alice Cooper? Is she obsessed or something?! There's no way this is because of love for her daughter. The best part of this big cast is the focus on once supporting characters in the comics. Let's face it: Kevin and Cheryl are amazing! She's powerful with a sharp-tongue and he's boy-next-door with witty comebacks. The best is when they feed off of each other. Kevin: Is cheerleading still a thing? Cheryl: Is being the gay best friend still a thing?! Permalink: Is cheerleading still a thing? Kevin is the drama-free friend that Betty really needs in her life. He's supportive and kind, but he has a focus on his own life as well. I can't wait to see more from him. What I really am excited for are the one-liners. 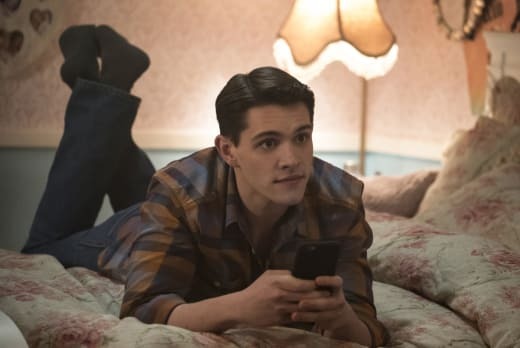 Kevin: Game changer - Archie got hot! He's got abs now. Six more reasons for you to take that ginger bull by the horns tonight. Permalink: Six more reasons for you to take that ginger bull by the horns tonight. The same can be said for Cheryl Blossom. She's got the mean girl attitude down and she delivers the resentful lines with ease. However, in a strange way, she seems to enjoy the company of Archie and gang, even with the insults she throws. Now that Jason's body was found, I have a feeling she's hiding something. She's the last person to see her brother alive – bullet wounds don't just happen. And for someone going through a loss, Cheryl is strangely confident. She must know more than she's letting on. Yes, let's not forget that ARCHIE IS 15. Don't get me wrong, I like K. J. Apa, his abs, and the entire cast, but some do look a bit older for the roles. Some of the "teens" didn't exactly look like they're 15. It's not too distracting, it's just noticeable. Jason's murder being the opening mystery is an interesting choice by the showrunners. I love a good murder mystery and I will be trying to figure it out. It feels very Twin Peaks! Though, from what I've learned from Twin Peaks and Veronica Mars, the mystery shouldn't drag on too long. It's gotta be the right amount to hook us in. But I love Jughead's voiceover giving us a clue for the next episode. Someone is getting arrested on Riverdale Season 1 Episode 2. But who could it be?! What did you think of "Chapter One: The River's Edge"? 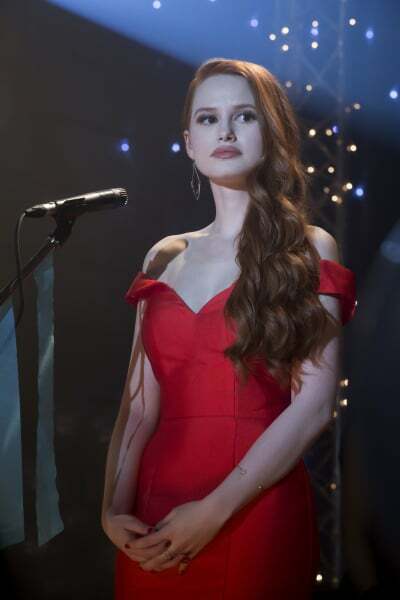 Who do you think shot Jason Blossom? Should Betty forgive Archie and Veronica? Why does Cheryl hate Betty so much? 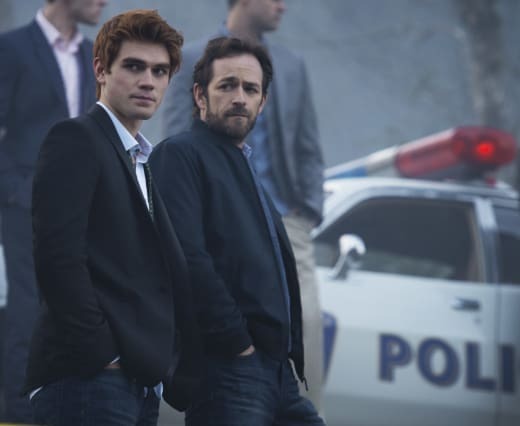 If you missed the series premiere of Riverdale, you can watch Riverdale online via TV Fanatic. Come back here and let us know what you think. What is a "Chock'lit Shoppe" and why does it sell burgers?! Permalink: What is a "Chock'lit Shoppe" and why does it sell burgers? !